Father's Intuition - We're Finished! privileged life in Baku. Her father and grandfather were very wealthy, due to their involvement with the region's oil. Zuleykha's life changed overnight, however, when the Red Army took control of the city (March 1920). Like so many other people who had wealth, Zuleykha's family fled their home the very same day. Photo: Zuleykha Asadullayeva visiting her childhood home in Baku on Samad Vurgun Street, 79 years later. During the Soviet period, the mansion was subdivided into numerous apartments for generals, professors and judges. It still stands today, housing several families. Here Zuleykha Khanim, who lives in Washington, D.C., tells what it was like to return to Baku 79 years later and walk through the rooms of the home where she grew up. The interview took place in June 1999 between Zuleykha Khanim and Azerbaijan International's editor Betty Blair in the living room of the Iraqi Ambassador's residence, found on the third floor of what used to be Zuleykha's family's mansion. The Ambassador's wife graciously invited Zuleykha in and, being new to Baku, was eager to learn the history of the building. Sadly, none of the other Azerbaijani apartment owners invited her in. It's such a strange feeling to be here inside the house that I grew up in so many years ago. 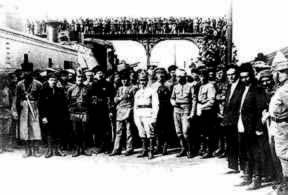 Photo: Red Army and Bolshevik leaders shortly after the takeover of Baku, May 1920. Note armored train at left. Photo: National Archives. I spent the most precious, carefree, peaceful days of our lives. So here I am. I don't know whether to feel joyful or sad. I can neither laugh nor cry. The truth is-the more I see of this place, the more I hate the former Soviet Union. They took everything away from my family-everything except for my culture and my language. Even though I live so far away, I knew that one day I would come back and see it. It's so painful, though, I'll admit, not to be allowed into the other apartments to see all the rooms where I grew up. The house has been completely changed: instead of one large residence, it has been split up into separate apartments. Photo: Anniversary celebration at Bibi Heybat oil field-one of the first major fields in Baku. August 1923. Photo: National Archives. It seems three different families live here now on the three floors. It used to be that the stairs were made of white marble, the walls of black marble. There were decorative golden stars on the stairs-long since removed. Now the beautiful marble is gone, and the walls that used to have fine murals are painted a solid color-pink, no less. The entrance hallways look so dirty and unkempt. It wasn't this way when we lived here. My grandfather, Shamsi Asadullayev (1840-1913), was a wealthy oil baron. Born to a poor family, he worked immensely hard to establish himself in the oil business. When his daughter Aghabaji Asadullayeva (my mother) got married, he gave her this Rococo-style mansion as part of her dowry. Grandfather had bought the house in 1904 from my aunt's father, the oil baron Musa Naghiyev, and hired an architect from France to work on it. The following year my family moved in and my oldest sister Maryam Sammadov (her married name) (1905-1991) was born. My parents had four more children who also grew up in this house: two sons-Assad (1906-1971) and Kuduet (1907-1979), another son Samed (1917-1919), and finally me (1914- ). My family called me Zuliya. The first floor was the most beautiful. Father's study was there. In the evenings, he would gather my brothers together for discussions; he liked to quiz them about their lessons. Mother had the second floor all to herself, and the children's bedrooms were located on the third floor. We each had our own room, and all of the rooms had fireplaces. My father, Khalef Meylamov, was very strict. He always insisted that we be well-disciplined children, despite the fact that we liked to play mischievous tricks. One time we even poured ink down from the balcony! As punishment we were made to stand in the corner until we had learned our lesson. Or sometimes when we were bad, we didn't get dessert. In the evenings, we would play music for our parents. My sister and I played the piano, while my older brother played the violin, and my other brother the cello. Our music teacher was a Jewish woman who lived close by. We received a Russian education. None of our books were in Azeri. We learned Russian, French, English and German, with a different governess for each language. They used to live with us. To tell you the truth, I never liked the German Fraulein; she was such a strict woman. We also had a religious teacher, Mirza Akhund, who taught us about Islam. He was a highly educated person. Our mother employed 18 Russian maids and a Lezghi cook. (Lezghi is one of the ethnic groups that live in Azerbaijan.) Despite all the help my mother had, she never allowed us to order the servants around. We were taught to address them politely, always prefacing our requests with "Please". I remember at Christmas time, we would dance around the Christmas tree and sing songs in German like "O Tanenbaum". About every three months or so, we would go to Europe or out to our country house in Mardakan down by the sea where my uncles would drop in for a cup of tea in the evenings. My mother, Aghabaji Asadullayev, was really a very nice person. She was the last one to get married in her family. Her father, Shamsi Asadullayev, was quite modern-in a European sort of way. He never allowed his daughters to wear a chadra (veil) except when they visited the cemetery. Actually, there were a lot of women living in the center of Baku who also didn't wear the chador-though most did in the Old Inner City (Ichari Shahar). Instead, Grandfather would buy his daughters beautiful hats from Paris. At that time Sheikh Islami, the religious leader in Baku, told him that people might grab the hats off his daughters to embarrass them. My grandfather had replied, "I'd like to see the man who would dare touch my daughters' hats." Life was privileged and happy for us. But then tragedy struck. In 1918 there was a barbaric raid by the Armenian Dashnaks led by Shaumian and Mikoyan. They looted the city and in the course of 13 days, slaughtered thousands of Azerbaijanis. At that time, we left Baku for Turkmenistan, where my father had cotton plantations and a big factory in Kizil Arvat. Later on, the Ottoman (Turkish) army occupied Baku and we returned home. Life went along beautifully. I was six years old when the Red Army entered Baku. I still remember it as if it were yesterday. Actually few people knew that the Red Army was coming; everyone thought it would be the Turkish army. That's what the government said. Now reflecting back, it's clear that Mammad Amin Rasulzade and the other government leaders did not want everyone to panic. Parliament met for three days deliberating whether they should surrender to the Soviets or not. Finally, they did, after being promised that the Bolsheviks would harm no one and not destroy any property. What poor judment to have trusted them! 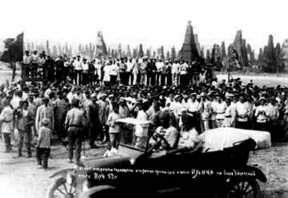 I'll never forget the scene in Baku's streets: it was April 23, 1920. My mother and father stood in the dining room looking out the window, watching the scene unfold. The streets were full of rough, dirty Red Army soldiers. My father turned and looked sadly at my mother. "We're finished," he said. Truer words were never spoken. We organized to leave home immediately. By 6 o'clock that afternoon, two coaches stopped by the house and whisked us away to a friend's home in the building that now houses the offices of SOCAR (State Oil Company of Azerbaijan Republic). We stayed there for a week, then left for our family's summer house. The Soviets would later confiscate our country house down by the sea in Mardakan and convert it into a resort. At least the gate still bears witness to its original owners. The sign reads, "Country House of the Asadullayevs." Our family was soon separated. Both my parents were arrested. My mother was eventually released, but my father was imprisoned for a year, by order of the Committee of Extraordinary Affairs. They were executing 50 people every day. I don't quite know how he managed to stay alive. I think my mother bribed the officials with some of her jewelry to get him released. But again they arrested him. In the end, my father was probably executed. We don't know what happened to him. He never got the chance to leave Azerbaijan with the rest of his family. Eventually, preparations were made for us to go to Turkey with the assistance of the Turkish Ambassador from Moscow. The authorities-those who comprised what is known as the "26 Commissars"-encouraged us to leave. In retrospect, we think it was because they knew my mother would be trying to take her jewelry out with her. And so in 1922 as we were getting ready to leave Baku by train for Batum [Georgia], they separated us children from Mother and threatened her that if she didn't give them all her diamonds, they would kill her children. And so Mother parted with her 20 boxes of silver jewelry and 120 karats' worth of diamonds. Of course, those robbers rationalized their own crime by alleging that all those jewels were bought with the blood of labor. But they would not concede that my father and my grandfather had been laborers, too. They had become wealthy by working. I remember how every morning at 8 a.m. my grandfather used to go to the oil fields in Surakhani and Balakhani. He had started out as a wheelbarrow driver transporting crude oil from the oil fields to the refineries. He was 18 years old when he started his own business in oil and eventually amassed 40 derricks, which produced more than 6 million barrels of oil per year. He also owned several oil tankers, pipelines and a refinery. His wealth and reputation extended from Iran, up through Russia along the Volga River to Lodz, Poland. So in 1922, we left for Istanbul. We lived there at the mercy of the Turkish people-Ataturk himself provided us with everything we needed until my brothers arrived. Luckily, my family still had some money through their dealings with the Standard Oil Company. It's an understatement to say that my mother, left alone with no husband, all these problems and three kids, suffered immense mental anguish. It wasn't an easy life for her. She was a fine woman. She was very patient and never spoke evil about Azerbaijan. She died in Turkey due to kidney problems when she was only 46 years old. My sister Maryam stayed behind in Azerbaijan. She was married at the time and couldn't leave her husband and his family. She suffered immensely. She was made to live in a tiny apartment. Later she told me that people had spit in her face. For the longest time, she had no job-nobody wanted to hire her. Finally, she decided to go to Moscow and complain to Prime Minister Kalinini. She told him that it wasn't her fault that she happened to be the granddaughter of Shamsi Asadullayev. "I have no work," she told him. "I'm hungry. So either let me leave the country and go to Turkey, or give me a job." He gave her a job, teaching in Baku. Later, when she applied for a visa to visit her family in Turkey, the authorities wouldn't let her leave the country. I didn't see her again until 1991-70 years later! She cried a lot when she saw me, but to tell you the truth, I felt little emotion. Even though we were sisters, she seemed like a stranger to me. She died shortly afterwards that year. I grew up in Turkey, went to university there, and eventually married an American, Gordon Baker, who was building a hydraulic plant there. We went to the U.S., where I became a high school history and geography teacher. I was very happy there and was received with open arms. Unfortunately, my husband died seven years after we got married. Then I met up with one of my brothers who was living in Brazil and taught there for four years. I'm retired now. So now how do I feel about being back in Baku? Well, this is my sixth trip back since Azerbaijan's independence. I don't regret having had to leave my Motherland. In Turkey, I was treated very well, I received a fine education. I lived a good life and, most importantly, I had freedom. In regard to Azerbaijan today, I have great respect for this country and its President. I think Heydar Aliyev will go down in history as one of the greatest statesmen of the 20th century. it's gone. Let it be gone. Money is not happiness; happiness comes from relationships with others, and in what we can do for others, especially when they're in need. Zuleykha Asadullayeva in Baku in June 1999. She lives in Washington, D.C. Her childhood home is in Baku and located on what today is called Samad Vurgun Street.